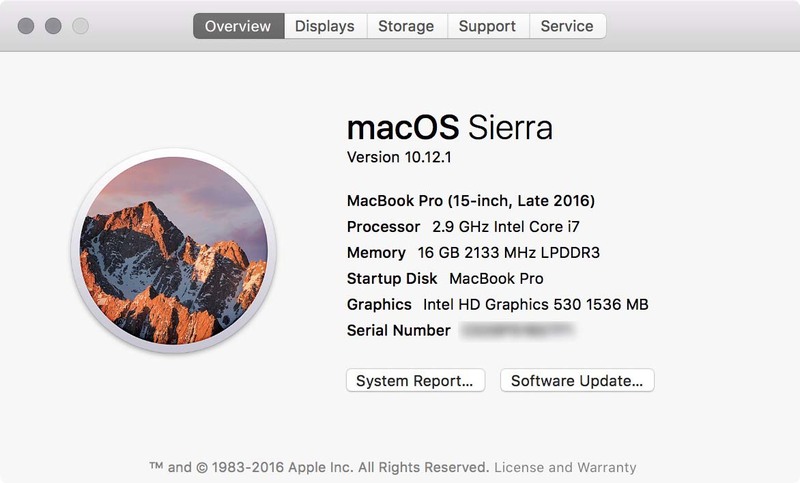 Some recipients of the new MacBook Pro with integrated GPU are reporting that the macOS System Profiler is reporting that the chipset is better than it is, but the problem is purely cosmetic and the GPU is being properly utilized by the system. Some users are reporting that the System Information app is reporting that the integrated chipset present in their new MacBook Pro is the Iris Pro 580, rather than the Intel HD Graphics 530 chipset. However, the Iris Pro 580 is not found in any of the processors that Apple has selected for use in the new MacBook Pro, and has not been included in the new hardware. Chips utilizing the Iris Pro draw significantly more power than the ones utilizing the Intel HD Graphics 530. "The problem is a result of mistaken communication between the System Information developer team, and the hardware team," AppleInsider was told by a source within Apple. "The [Intel HD Graphics] 530 is reporting to the OS right, it's the System Information app database that's leading users down the primrose path." AppleInsider was not given any timetable for a bug fix to the System Information app. Yea, and I nearly returned my built-to-order MacBook Pro with the AMD 460 as About this Mac reports the built-in graphics card first, instead of the built-to-order Radeon 460. You need to go into the System Report to actually view the Radeon 460 option. It's a PCIe x8 card. And in other news ... there seems to be an issue with the Thunderbolt3 driver causing kernel panic with apps like Carbon Copy Cloner and Synchronize Pro X Plus - these apps use low level device copy and when accessing drives through Apple's Thunderbolt3 + TB3 -> TB2 adapter they repetitively cause kernel crashes. Well that is more of a quality control issue. New model, new OS, early adopter =headaches. Sad to see kernel issues related to copy operations, though. If the OS contains information about Iris Pro 580 then perhaps it is planned for the next Mac mini. The 580 is already used by Intel in their Skull Canyon NUC (Core i7 6770HQ). It would be fantastic to have that CPU in a Mac mini. Mine shows just fine so report that. I agree...to test..why don't you plug in a USB C external hard drive (or one with an adapter) and use something like Time Machine to do a backup. It won't cost you anything and it would test to see if its something else. I wish i could purchase a 13 inch model with a discrete GPU. AUD$3600 entry for a discrete GPU, that isn't even that great to begin with, is INSANE. Sorry Tim, I'll be keeping my old Air and custom building a gaming PC/hackintosh. Things like reboots typically come from problems that user installed applications shouldn't be able to access. That's probably why the guy said it can't cause a kernel panic. Otherwise you're likely to just have an application crash rather than your entire computer. Driver bugs can cause that kind of problem, and they can be on either Apple's end or due to third party hardware (anything you plug in). The software is most likely revealing a problem elsewhere, not creating that problem. Well, generally speaking, there would be a product road-map somebody would own ensure completeness and accuracy. With a biff-up like this, it's possible that Apple outsourced this to Santa Claus, The Tooth Fairy or Snow White. When I scheduled time at the "Genius" Bar. At first, they told me the logic board was bad. $900 repair replacement. They proceeded to tell told me that the only way to fix the issue would be to reload the OS first. HOWEVER, I ran Parallels within MacOS to show the "Genius" that Windows sees all three USB ports just fine (Plugged in my iPhone to the "disabled" USB ports which MacOS fails to recognize). So everything works just fine on Windows 10; connecting my iPhone to the two USB ports . Then they said it was strange but then advised me that I wouldn't be able to restore from a TimeCapsule backup; so new drivers are installed. They went to the accessory wall, and grabbed a $149 external drive that I needed to buy to create a separate backup of my home directory. I'd have to re-install software, which would easily take a day's time to reload. Seems Apple doesn't give its technicians many troubleshooting options... even for the hardware (and software) it manufactures and I bought. I left Apple and later bought a $10 USB hub dongle from WalMart. Probably the last Mac I'll buy.